It was a time of anxiety for the regular buyers of Nandini milk in the city as they did not find any date on the milk packets which is always printed on the back of the packet. 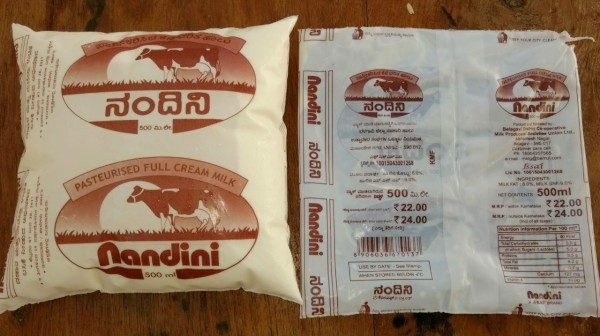 Nandini, marketed by Karnataka Co-operative Milk Producers Federation Limited (KMF), were being supplied without due packaging dates for the past two days in Belagavi. J.R. Manneri, Managing Director of KMF Union, Belagavi, admitted about the lapse stating that the stamping/printing machine developed a major technical snag two days ago. Therefore, the milk sachets carried no packaging dates. The dealers had been already informed about it but there seemed to be communication gap as far as consumers were concerned. This is not new thing. I can show you that milk packets of next day are available previous day.